American tourist dies taking selfie in Greece – Royal Times of Nigeria. An American tourist Diannarosa Alduncin Delgado has died after falling off a cliff while taking a selfie on the Greek island of Zakynthos, police have said. The 22-year-old Delgado who had dual American-Cuban citizenship, was on holiday with her boyfriend, Farid Mohsanshervin, also a U.S. citizen. 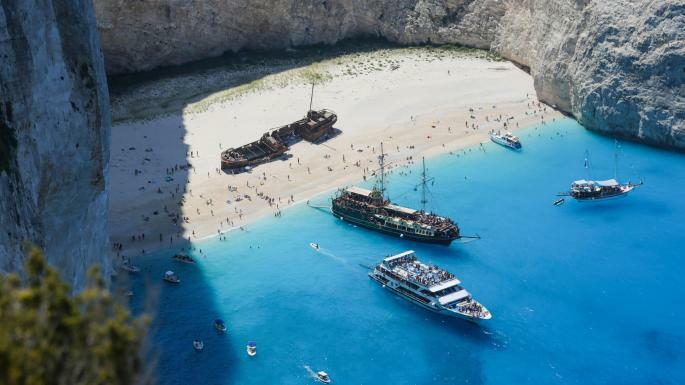 According to reports, Ms Delgado was taking a photo against the backdrop of Shipwreck Cove (pictured); one of Greece’s most idyllic beaches and a popular tourist area. It’s named after a ship that ran aground during a smuggling trip which can still be seen on the sands. The cliffs surrounding it are up to 900 feet tall. Local media also reported that the victim had shouted before tripping over the cliff. Her body was recovered by the coastguard on Monday. As the investigation into the incident continues, residents have called for security measures to be introduced in the area to prevent further accidents. Two months ago a Greek student aged 23 also died while taking a selfie in the same spot.